The other day I was getting so frustrated at my Android phone. It was turning off and on at random times and freezing up at other times. To say I was over it was an understatement. I have really wanted an iPhone ever since I got my Android phone but I was just a tad too early since Verizon, at the time, did not carry it. Well fast forward to a couple weeks ago and I was able to upgrade a little early to an iPhone for a discounted price since I've been a loyal customer for over 10 years! Heck yes! I am obsessed with it now and must say it is 10x better than my old Android. My iPhone holds a charge, has a better camera, faster internet, and the overall interface works so much easier. I guess I can kind of see why people are Apple obsessed. My favorite app has been Instagram, which I'm sure comes as a no-brainer to all of you veteran iPhone users. Since we're so super close to finishing the nursery I've had some fun snapping some sneak peeks. I promise to do an official reveal super soon! Plus, I've got some shower pics to share as well! awe...it's looking so cute!!! can't wait to see the entire thing! 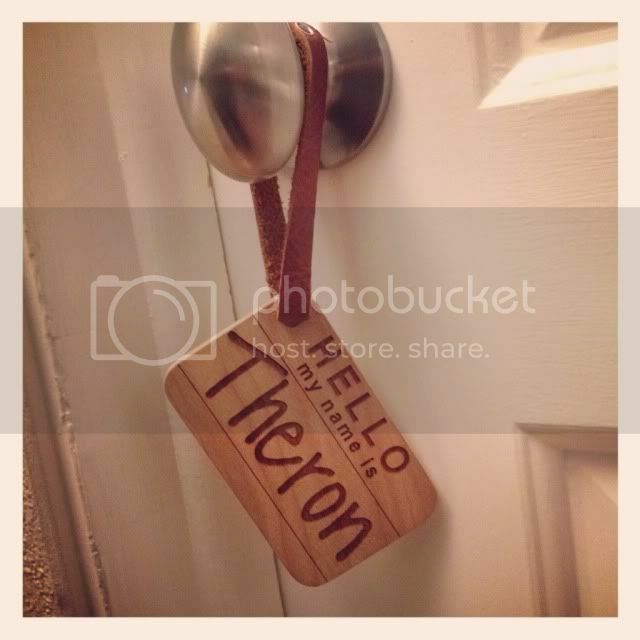 Love all these pictures and how you hung his name on the door handle. Too cute! Hello, hello. Love the sneak peak...can't wait for the reveal! Love, love, love baby boy's name!!! But I'm a sucker for unique names since I was in second grade with three other Michaels. And two of us were Michael Ks, so we had to write out our last names on every assignment instead of just writing our initial. Funny what you remember from a second grader's perspective. Oh, and Joi honey, I'm at home today with a kidney stone. The nurse in the ER last night compared it to child birth, to which I must 150% recommend the epidural all the way! Looking adorable already! Can't wait to see the rest! Love the sneak peaks! And the name you picked is adorable! it looks gorgeous! I love it! I love his name too! My husband's droid did the same type of things! It was always turning off by itself & freezing. We asked the at&t workers & they said nobody had complained about it turning off by itself, so he thought it might have been just his. He recently got an iphone about two weeks ago & he loves it! i think the nursery is serious perfection! and i love his name too~ awww! I'm a Verizon customer too and recently switched from Android to iPhone.. so much better!!! 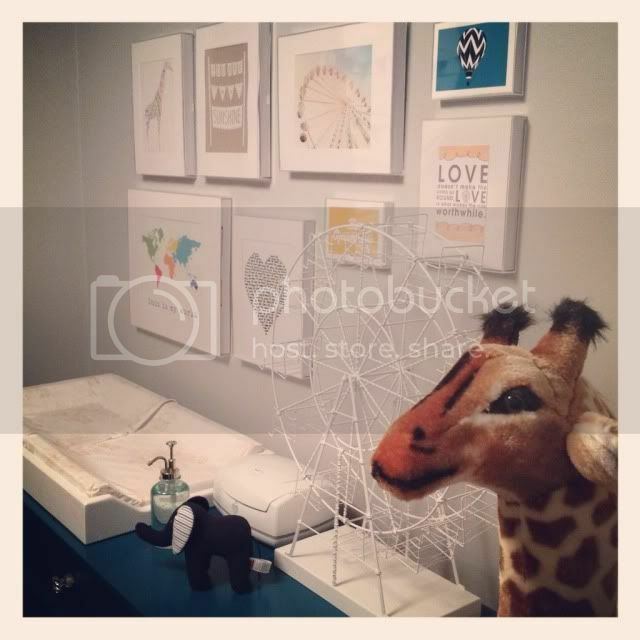 Loving IG.. loving the babes name + the nursery.. too adorable!! Love it! That dresser color looks amazing. I can't wait to see it all! And I love the baby's name! I've been debating the switch from Android to iphone, and I think you've convinced me. Mine IS doing exactly what you described. And the battery life is awful. So adorable! Love the art wall. Love it! And I LOVE the name too, Joi. I know you are super busy so thanks for posting little updates! I love the hot air balloons, they are fabulous. I can't wait to see the whole thing! Love the name! So cute! And the nursery! What a fun space! Love the name and the cute nursery! Can't wait to see more! Looking so cute! 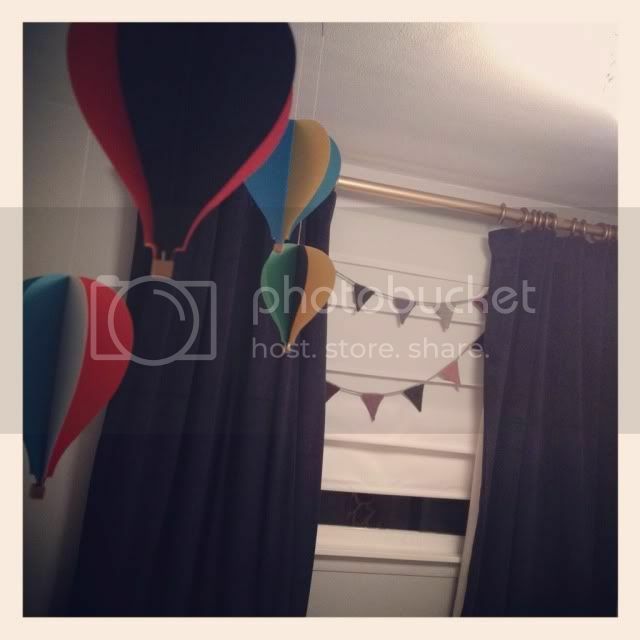 Love the mobile and the bunting to go with your vintage circus theme. Can't wait to see the big reveal - its looking great. IT'S FABULOUS! I knew it would be, but WOW! Those air balloons are killing me with cuteness and I love the navy curtains so much. No seriously, I cannot wait! Did I miss the announcement abotu the name? So cute! And I love the little tag, too. PS - Any chance you'll share how you made that changing pad holder? I love it! i want you to know i specifically checked your blog to see more nursery pics. Love the little nametag. SO cute. As i bonus..i love your pics with the wide angle lense. i want to try that out when i'm home! so cute!! Can't wait to see the whole reveal! Theron!! OMG I LOVE his distinguished name!! I'm just giddy awaiting the nursery reveal & this sneak peek is sending me into giddy overdrive.